TowBoat U.S. Ft. Lauderdale recently added a 4 wheel drive Ford F-350 7.3 Liter Power Stroke Diesel Flatbed Truck to their fleet. The Truck boasts an 8' x 10' Flat cargo area, and a 4000 lb. load capacity. The truck also has a Port Everglades Dockside Parking pass. This makes loading and unloading parts and spares to ships in port a breeze. 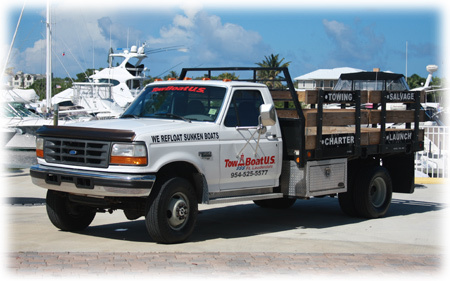 With 24 hour Launch and Dockside pickup services; TowBoatU.S. Launch service is always standing by and ready to assist.